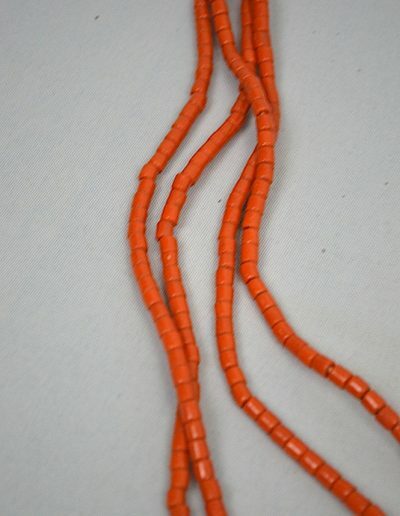 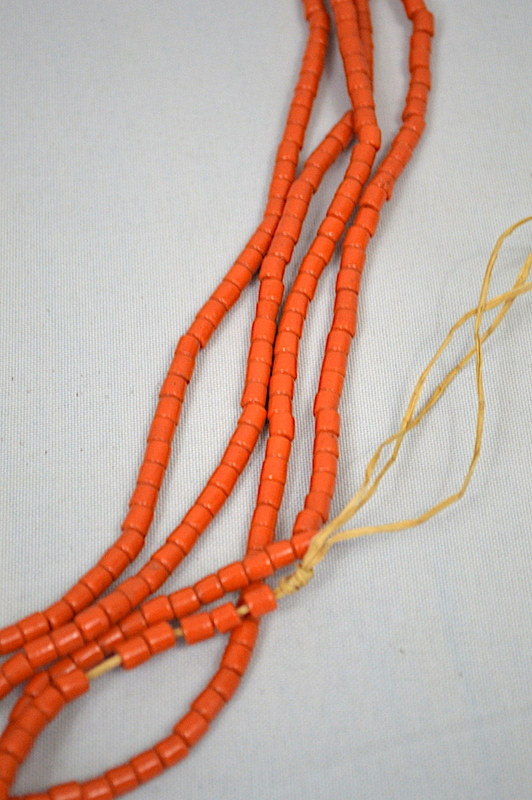 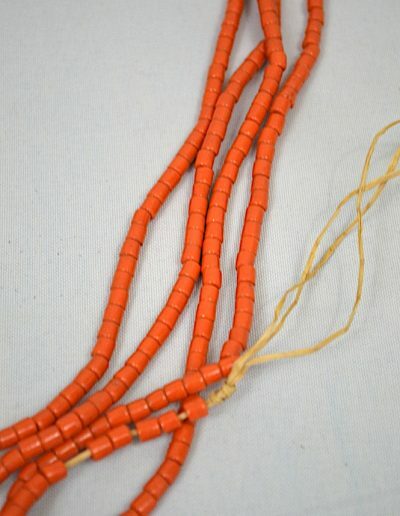 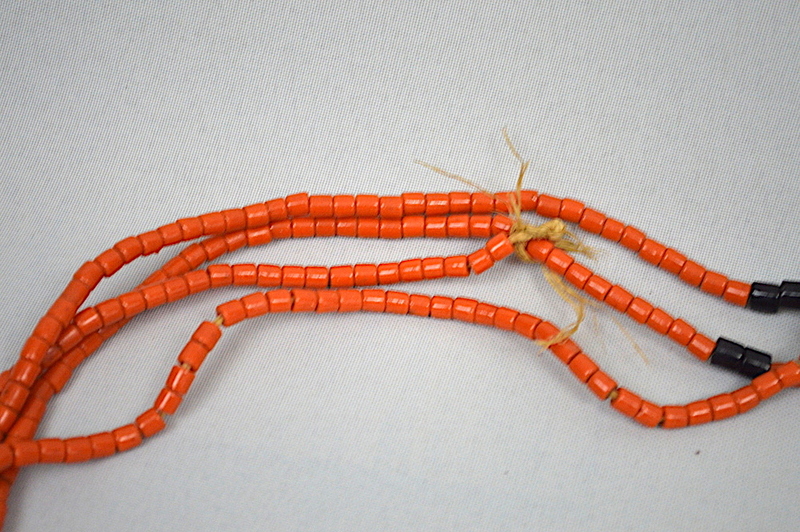 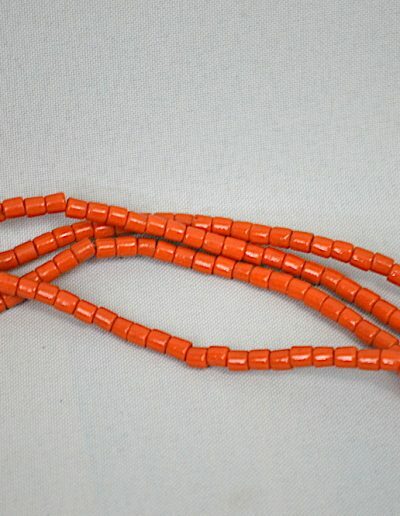 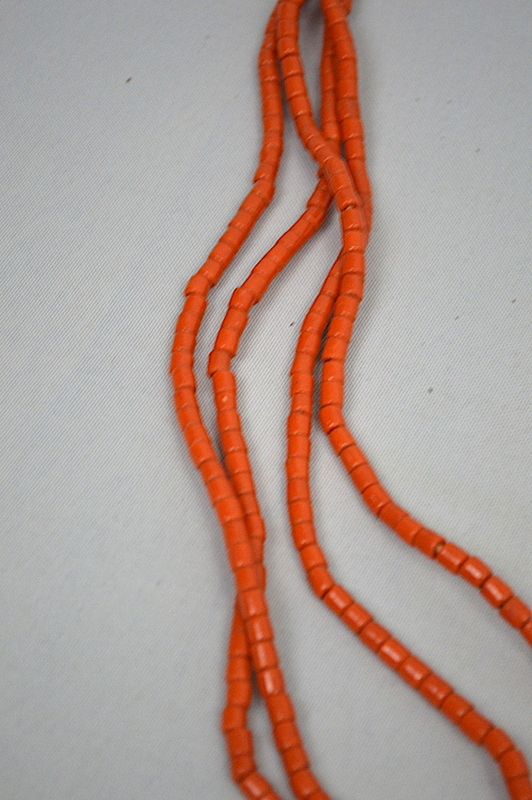 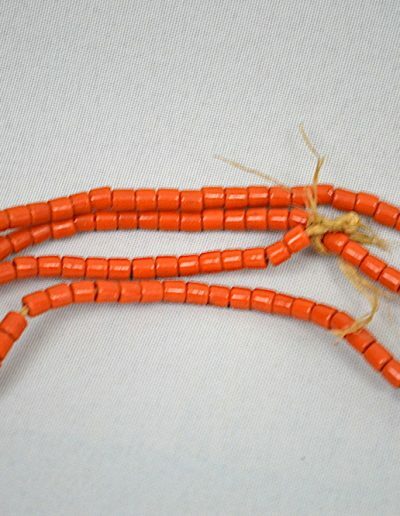 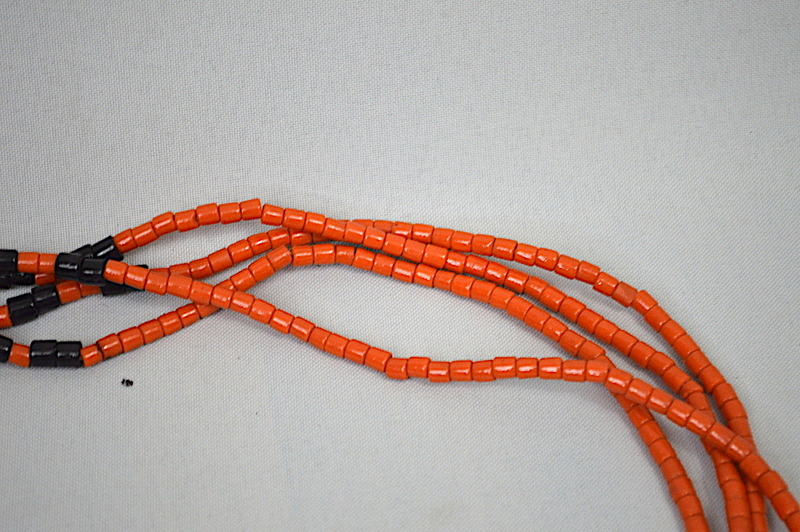 Kuba beaded necklace made from multiple strings of raffia onto which small orange glass beads have been carefully threaded. 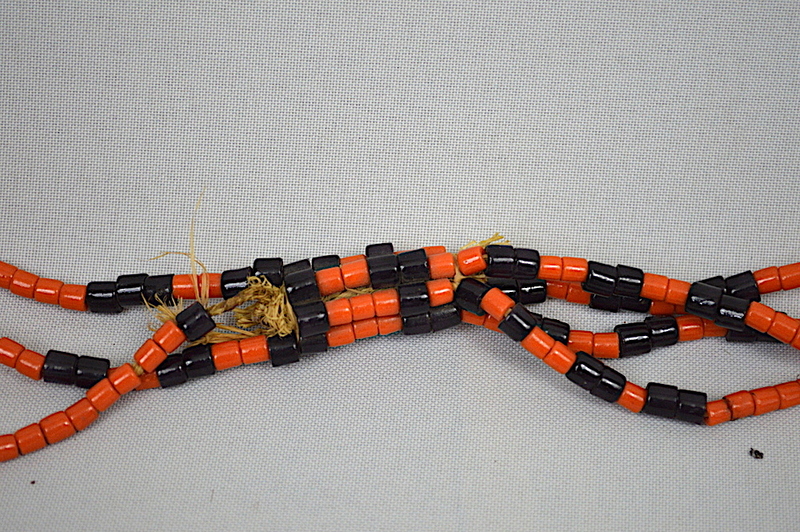 An alternate black bead pattern has been created where the necklace sits at the back of the neck and also at the front which sits either side of a pendant drop. 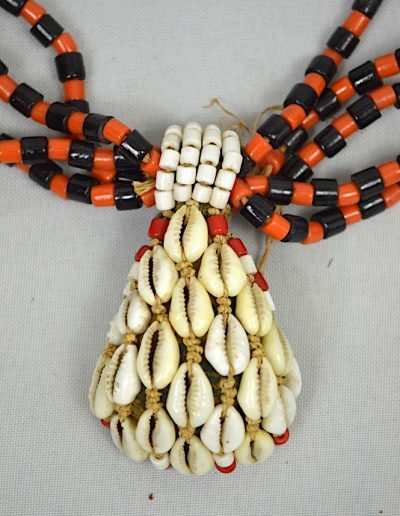 Clever use of cowrie shells has been fashioned to completely cover the drop pendant giving the necklace a feel of opulence. 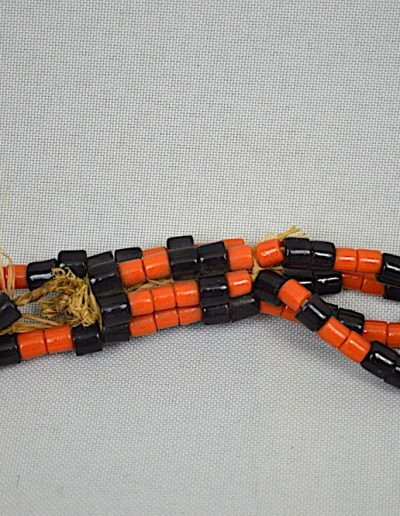 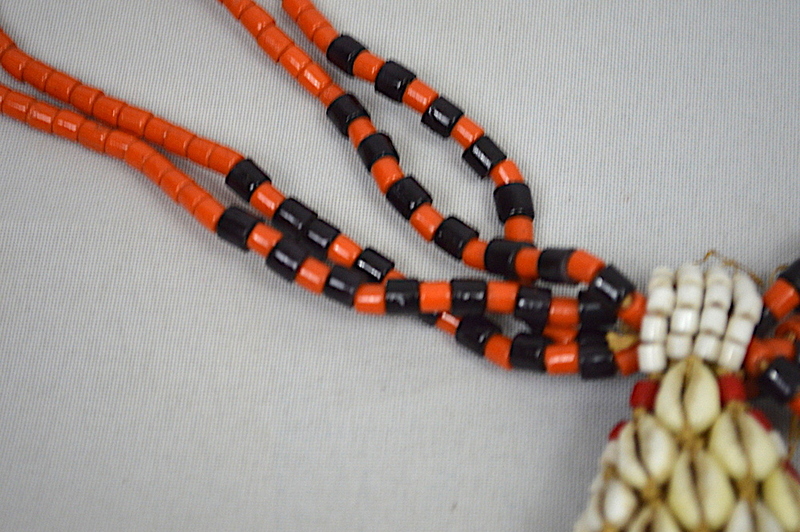 The orange and black beads adding a good colour contrast enhancing the cowrie shell pendant. 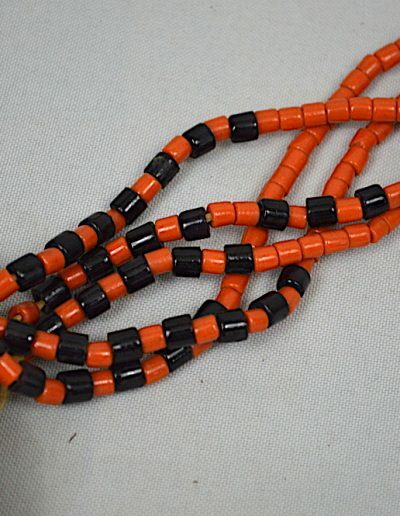 The Kuba people are renowned for their highly decorated ceremonial dress and sense of adornment. 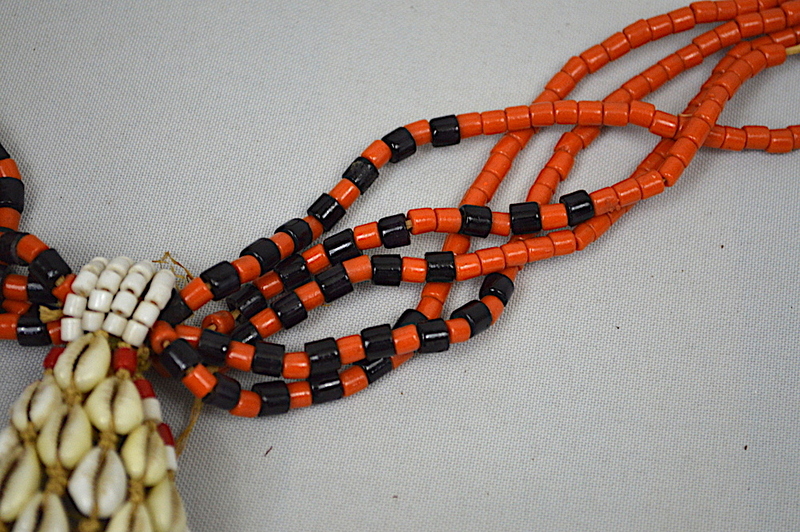 Beadwork is carried out within the Kuba tribe and is used to adorn many items. 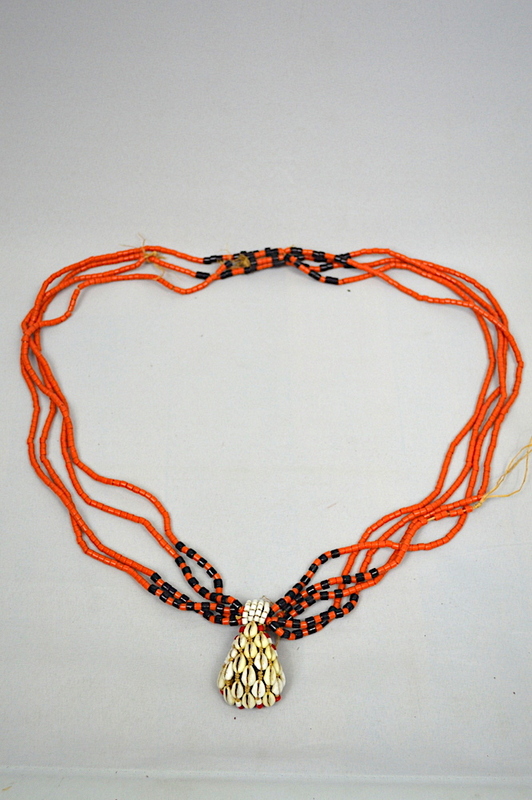 As with the geometric patterns that are skillfully created to produce the wonderful shoowa/kassai velvet textiles so to these skills are shown in the lovely beaded works that exist. 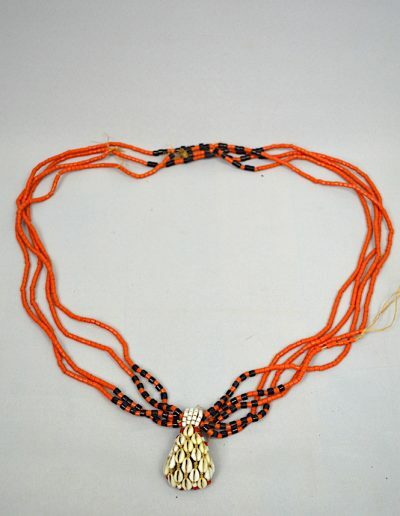 Many different colours can be used to give a charm and regal feel to each design. 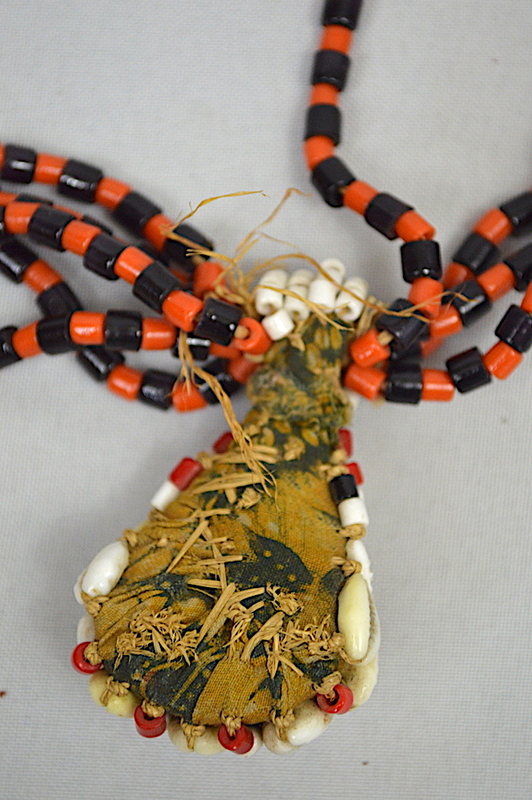 The most intricate being showered over the chief of the kingdom to show his standing and importance. 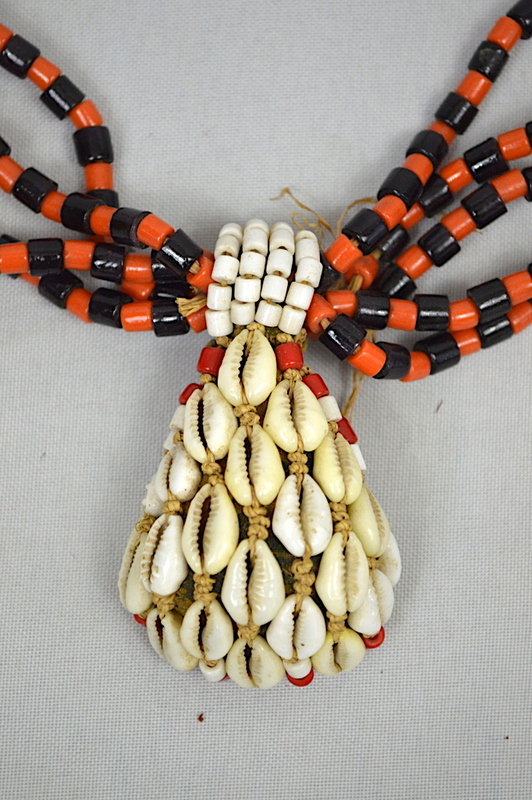 Cowrie shells are used along with the beadwork designs giving a greater appearance of finery. 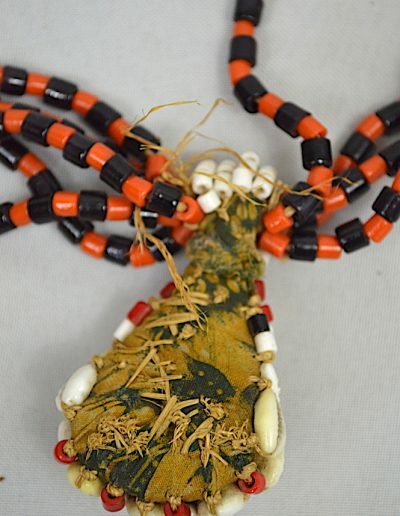 Great skill being shown in the making of such lovely items of Kuba art. 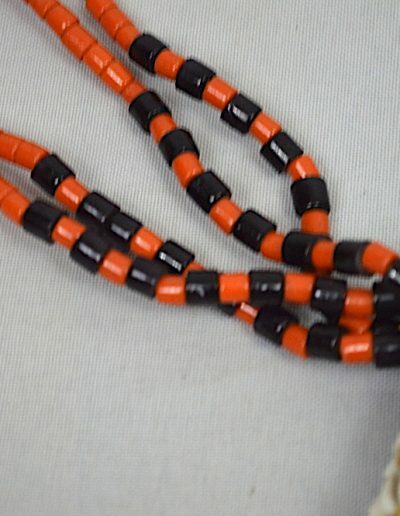 Beadwork has been a part of African life for centuries and continues to play its part today demonstrated in the lavish ceremonies that still are carried out.